Although most permanent RV parks surrounding Vancouver are sold out for the 2010 Winter Games, the newest accommodation announcement is that recreational vehicles (RVs) will be allowed to park at Jericho and Spanish Banks beaches during the 2010 Olympic Winter Games for just $95 CAD per night. RV-ers lucky enough to secure a spot will enjoy some of the best views of the city and mountains and great access to downtown. Here's a link to a great website called Lolo's Extreme Cross Country RV Trips, at www.cross-country-trips.com. The site is maintained by a family who have crossed the USA seven times in nine years, covering 66,800 miles in their motorhome. They have travelled through 49 states, 10 Canadian Provinces, visited 60 National Parks and 36 State Parks. They've hiked, rafted and gone fishing in some of the most beautiful places in North America. "As a result, after 5 years from Lorry's diagnosis, we both left our professional corporate careers - bought a Lazy Daze motorhome - and set off to show our children the beauty of the nation's National Parks. We feel we have taken a "trip of a lifetime" every summer - and have done it with our offspring at an age where they can truly begin to appreciate it." Zorbing, also known as Sphereing, is another attraction available to tourists in New Zealand. Sphereing (globe-riding, zorbing) is the recreation of rolling downhill in a sphere, generally made of transparent plastic. Sphereing is generally performed on a gentle slope, but can also be done on a level surface, as well as on water, permitting more rider control. In the absence of hills some operators have constructed inflatable, wooden or metal ramps. There are two types of spheres, harnessed and non-harnessed. The non-harness spheres have up to three riders, whereas the harness variety is constructed for one to two riders. Double-harness spheres have different slope requirments, and must only be operated in specific locations. The longer runs are approximately half a mile. The first sphereing site was established in Rotorua, New Zealand, by Andrew Akers and David Akers. In 1994, Dwane van der Sluis and Andrew Akers conceived the idea for a type of sphere in Auckland, New Zealand, calling their invention the "Zorb". With two other investors they created the firm ZORB Limited, and set to work commercializing sphereing. Longest sphereing ride held by Steve Camp who travelled 570 metres (1,870.1 ft). Fastest sphereing ride held by Keith Kolver who reached a speed of 52 kilometres per hour (32.3 mph). Video: Justin takes a water assisted ride in a Zorb -- looks like great fun! Did you know there are 100 thermal hot pools around New Zealand? Around 35 of those are commercial and around 60 are all natural, non-commercial hot pools. For a complete list, go to http://www.nzhotpools.co.nz/hot-pools. Thermal pools are one of New Zealand's great side-trips, so if you're campervanning around NZ, make sure you unwind at one. 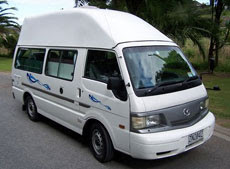 And if you're looking for a steaming hot deal on New Zealand Campervan hire go to http://campervanhiresalefinder.co.nz. The video below features Wakite Valley Thermal Pools www.hotpools.co.nz, which is around 25 minutes south of Rotorua, off State Highway 5. The pools tap into the ‘Living Waters’ of Te Manaroa Spring, the largest single source of 100% pure boiling water in New Zealand. There's a main splash pool (35-38C), an adjoining toddlers' beach area and a sit and soak pool (38-40C) as well as a tranquil garden pool. From the private spas, you can control the temperature of your own pool and take in native bush views. There's also an Eco-Trail -- an educational walk taking you to Te Manaroa Spring. Along the way you will learn about ferns and mosses that are unique to a few select geothermal areas in the southern Rotorua area. All this plus a cafe and, importantly, a 20 site campground with shower, laundry & kitchen facilities. And yes, there are powered sites available. Remember, for a great deal on campervan hire New Zealand go to http://campervanhiresalefinder.co.nz. The Coromandel Peninsula really is a playground for waterbabies, with the Firth of Thames leading north to Coromandel Harbour and the Hauraki Gulf on the west coast -- and glorious beaches and bays facing the Pacific Ocean on the east coast. There's opportunity to do all sorts of outdoor activities like canoeing and kayaking, as well as fishing, diving, snorkelling or just taking it easy on the beach. It's such a beautiful area to visit, and the water's getting warmer already. Book a Coromandel roadtrip -- check out the amazing offers on New Zealand campervan hire at http://campervanhiresalefinder.co.nz. Video: Dig your toes into that sand, Justin! Driving can be quite tiring, especially around New Zealand's gorgeous countryside and its gorges, rivers, coasts and mountains. It's really important to stop for a break; once every hour is a good guideline. 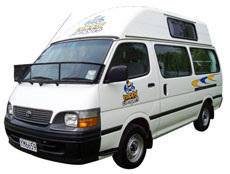 If you're looking for a great deal on New Zealand campervan hire go to http://campervanhiresalefinder.co.nz. The site has negotiated bargains with major campervan rental companies -- and we all know how it pays to check out the special offers. A brightly coloured archway greets visitors as they arrive at this quintessential Northland town. Sculptured columns beckon those with crossed legs to make their way quickly to find comfort and relief within its walls. 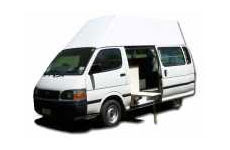 If you're looking for a great deal on New Zealand campervan hire go to http://campervanhiresalefinder.co.nz. Touring the country in a campervan sure is easier than it used to be, especially in an age where GPS equipment is easily at hand. But sometimes a bit of local knowledge can go a long way. Tourist spots are one thing, but the advantage of hiring a campervan is that you don't have to stop at the same places as busloads of other tourists. So if you're after specialist local information -- whether it's about good fishing spots, good surf beaches or idyllic, out of the way places to visit, ask a local. Try a hotel publican, a service station attendant. You'll find that most Kiwis are pretty friendly. Kelly Tarlton's Underwater World is one of Auckland's favourite attractions. When the late Mr Kelly Tarlton, a world-renowned marine archeologist and diver, had the idea to build an aquarium in disused sewerage holding tanks under Auckland’s waterfront, to many it seemed like a hare-brained scheme. But the construction of the 110-metre acrylic tunnel used for the Underwater World was a feat of Kiwi ingenuity. Kelly Tarlton’s dream came to fruition in January 1985, when after 10 months of construction, Kelly Tarlton’s Underwater World opened. The underground project cost NZ$3 million. It was the first time a 110-metre long, waterproof, transparent acrylic tunnel had been built. Importing prefabricated tunnel sections was too expensive, so Kelly flew in enormous, flat sheets of acrylic from Germany. These were formed into the correct dimensions and then the one tonne sheets were oven heated and curved to the required tunnel shape. The sections were carefully lowered into the site in special order, through a hole in the footpath of Auckland’s waterfront. After the tunnels were sealed, everyone took a deep breath as they were tested to ensure they were watertight…and with a sigh of relief… they found no leaks! This was a world first; a transparent, underwater tunnel from which the public could be face to face with Sharks, Stingrays and other marine creatures. Sharks, stingrays, penguins -- they're all at Kelly Tarlton's Antarctic Encounter and Underwater World. You can even book a 'snorkel safari' and get up close to more than 40 species of fish from New Zealand’s coastal waters – including Blue Mao Mao, Eagle Ray, Snapper, Trevelly, Pig Fish and the famous Moray Eel. If you're looking for a great deal on campervan hire New Zealand go to http://campervanhiresalefinder.co.nz . If you're looking for enviro friendly camper hire in Germany check out the deals at Enviro Wohnmobil go to envirowohnmobil.com. Enviro Wohnmobil provides motorhomes from one of the most innovative motorhome manufacturers in Europe -- award-winning vehicles with comfort, safety and style as you explore the beautiful German countryside. Brian bought a large pickup truck and camper and equipped it with all the essentials...but these essentials would be powered by the sun and the wind. 6 large solar panels are on the RV, along with a retractable wind turbine..."the refrigerator , microwave, the vents, the fans, the lights, recharging all the camera batteries. Everything comes from the energy of the sun and the wind." Even rainwater is collected, filtered and used for drinking and bathing. Remember, for enviro-friendly camper hire Germany check out the deals at Enviro Wohnmobil go to http://envirowohnmobil.com. So what makes a motorhome a motorhome? 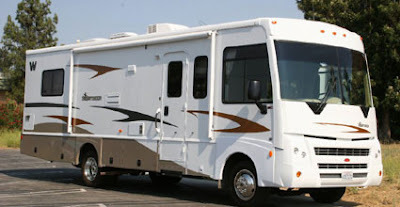 In general a motorhome is considered a self-contained vehicle that often contains cooking, sleeping, and sanitary quarters and a drivers cabin that can be entered via walking position. They are also called motor home and motor caravan (or motorhome and motorcaravan). 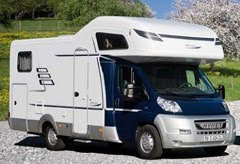 Class A Motorhome: These will be either purpose built by specialist motorhome/RV manufacturers or they will be built on a truck or bus chassis. The larger floor area (than Class B or C motorhomes) allows for accommodation of more people and the luxury of more or larger amenities. Class B Campervan/Motorhome: These holiday homes are built using a conventional van (e.g. Ford Transit van, Dodge Sprinter, Toyota Hiace) thus they are also referred to as campervans. The van may be modified such as a raised roof may be added or the back replaced by a low-profile body. The advantage of the van sized vehicle is that while the living space is limited, they can be driven almost anywhere you can drive a car. Although often considered campervans, many Class B Campervans have all the features to be considered a motorhome (cooking, sanitory and sleeping quarters and easily accessible drivers cabin). Class C Motorhome: Class C motorhomes can be the same size as Class B motorhomes however they have separate driving and living units. Class C or “Mini-Motorhomes” are built on a custom made or truck chassis and they usually have a cabin or “cab-over” above the driving unit which contains a bed (in the UK this is referred to as the Luton). Awning: An awning is a secondary covering attached to the exterior wall of a recreational vehicle. It is typically consists of canvas made of cotton, acrylic or polyester fabric that is stretched over a metalic frame. Black water: Waste water from a recreational vehicle toilet. Dry camping (also called boondocking): This referes to camper in a designated area that has no amenities such as water, electricity and sewage hookups, including parking lots or driveways. Generator A gasoline, diesel or propane-powered device for generating 120 or 240 volts AC electrical power for use when boondocking or dry camping. Generators are rated by their electrical output, usually in watts. A minimum generator size for a small RV would be 1500 to 2000 watts. To run an RV air conditioner, a minimum of 3000 watts is usually needed. Larger RV's with multiple air conditioners require generators with 6000 and more watts of capacity. Generators also charge the house battery(s). Generators are common in North America but very unusual in Europe, where their noise would be an unpopular intrusion to the rural calm of a campsite. Grey water: Waste water from faucets and showers. Pink water: Refers to water to which 'pink' antifreeze has been added. This is done in cold climates to keep the internal plumbing pipes and tubing from freezing. Pink is used to imply that it is not toxic. Normal antifreeze is colored green or blue to show that it is a toxic chemical. Shore power External source of electricity provided to the Recreational Vehicle. Slide-Out A section of the Recreational Vehicle that can expand to create more space inside the the unit. White water Fresh water that is taken into the Recreational Vehicle. Wild camping/Bush Camping: Term used to refer to camping at unofficial sites or at the side of the road. Depending on the country, this may be highly risky or illegal. Winterize/Winterise To prepare an RV for winter weather by removing water from the hoses and tanks.